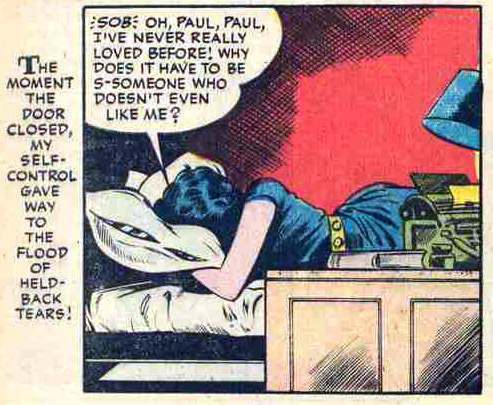 In comic after comic, with rarely an exception, you have the requisite scene of the beautiful female lying in bed pining desperately over some clueless oaf. No doubt, it’s still pretty common for females to fantasize over men. Feminism made great strides towards creating a more level playing field, but it didn’t do away with human nature. To a certain extent, the cliché is a timeless truth: girls will be girls, and boys will be boys. 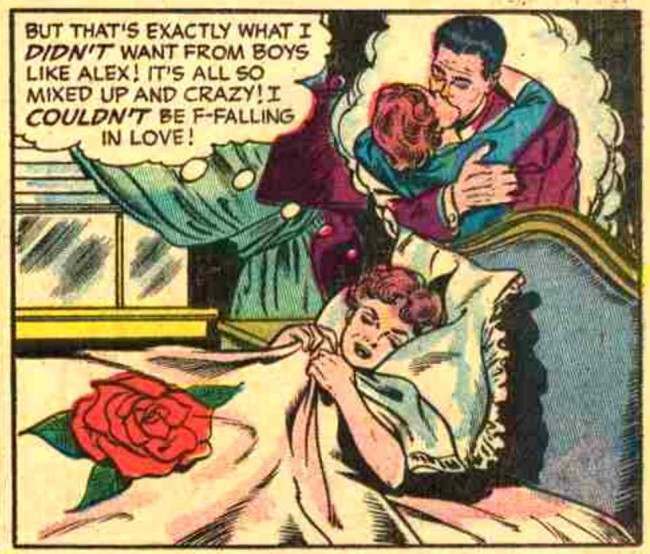 That being said, the breadth and scope of bedtime fantasy scenes in romance comics is jaw-dropping insane! 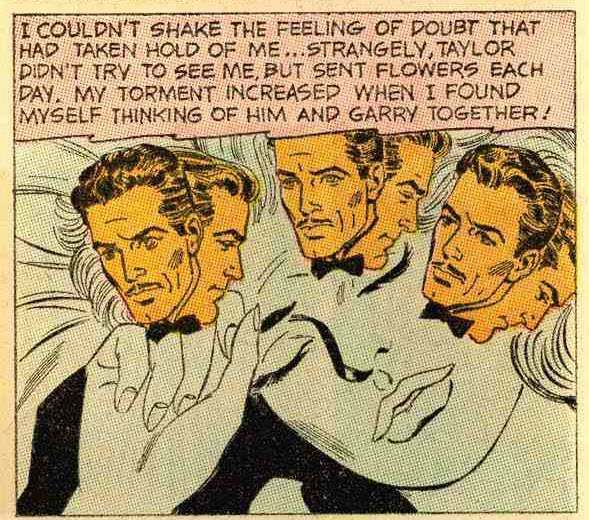 All the way through the 1950s and onward into the 70s, romance comic women fantasized about their men. 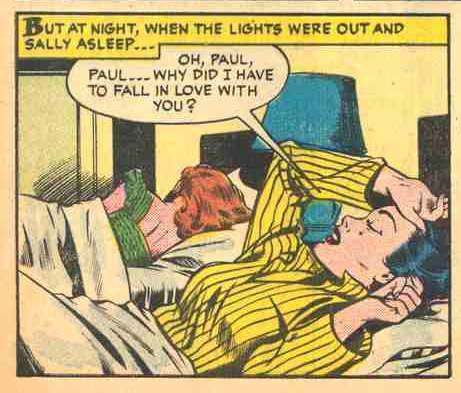 Never a happily lustful dream – always a stress nightmare. 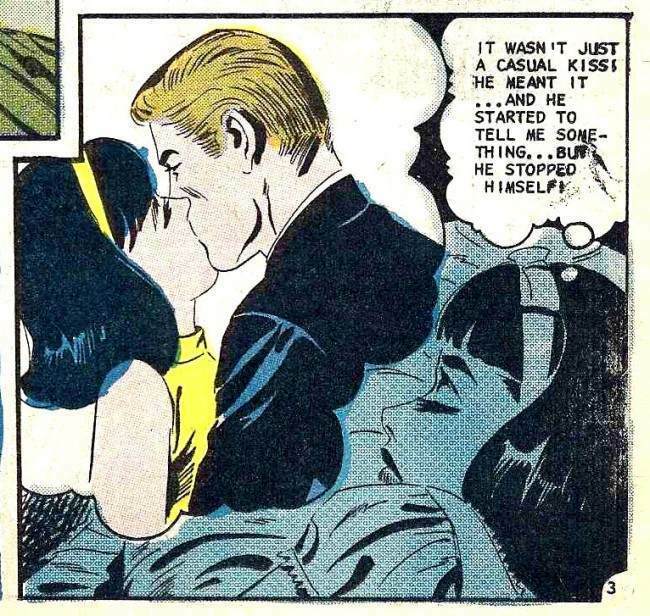 If she’s reliving a passionate kiss, the man has since ditched her for another woman. If she’s reliving a hot-blooded embrace, the man has since disowned her and left her for dead. You get the picture. These poor ladies were conflicted messes. The stories always end on a positive note, with Prince Charming having a change of heart, etc. 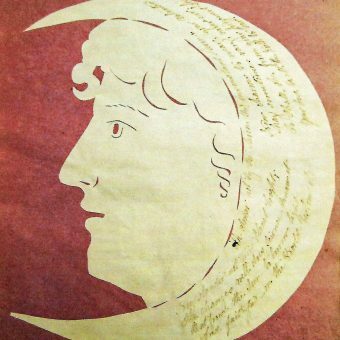 However, the pages leading up to the fairy-tale endings are filled with neurotic torment. No wonder the “free love” movement took hold so easily. 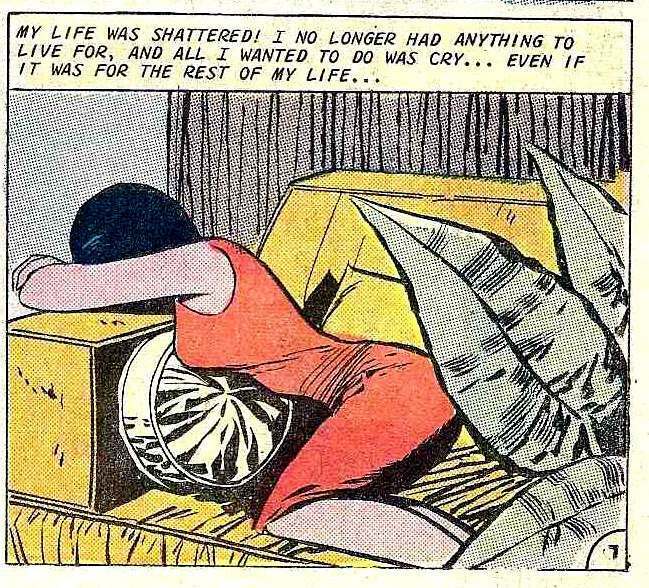 The whole mating process for women was one of constant fear and self-loathing. Catching a man was a matter of life and death…. or worse. 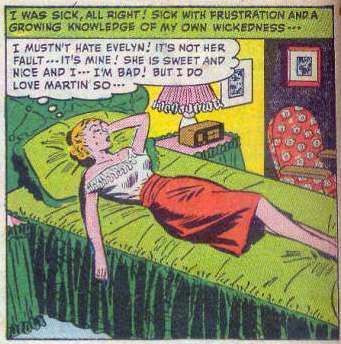 Life as a spinster was a fate worse than death. 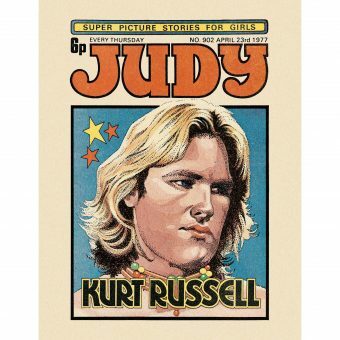 If these comic books were even close to realistically portraying the feminine mindset, the eagerness of Boomer women to embrace the Sexual Revolution is no longer a mystery. It’s a toss-up between Popular Andy or Faithful Griff. Whatever you do, don’t go with Skeeter – that way lies madness. The anguish of losing this pathetic douche keeps this poor woman awake all night. Did men realize the power and dominion they wielded? Of course, this only applied to the breadwinners. 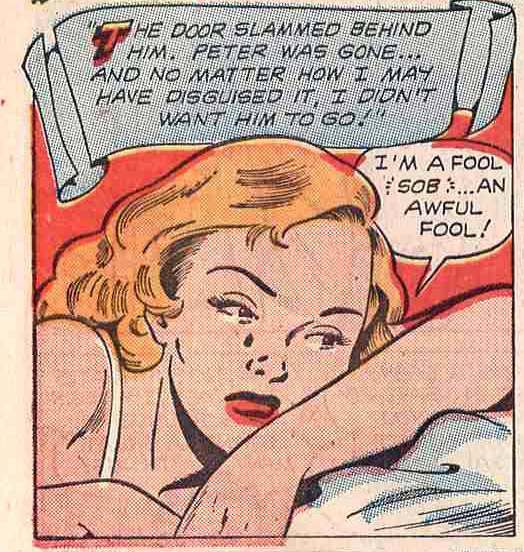 Women weren’t having night terrors over blue-collar fellas. 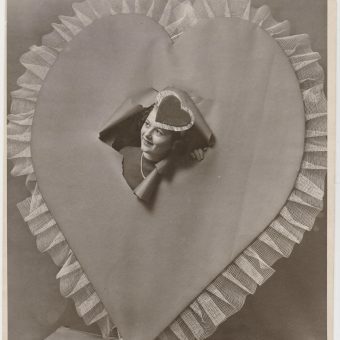 It was always the urban professionals stealing the young girls’ hearts. 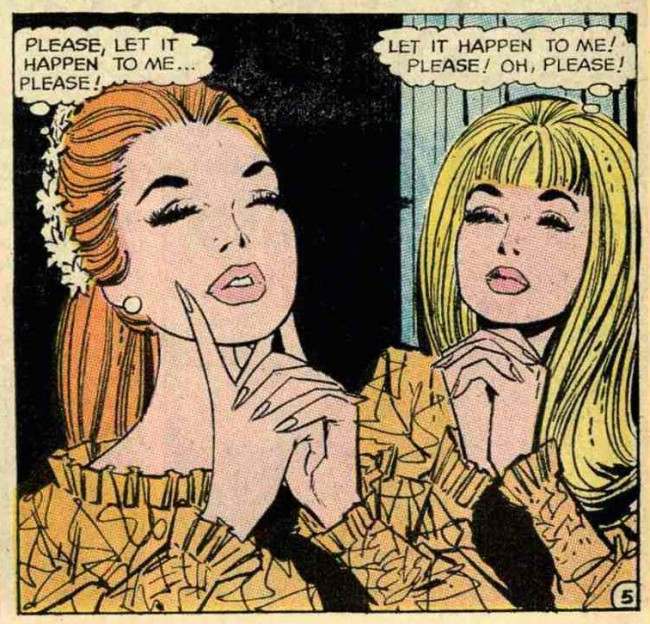 Miss Temple fades in and out of rapturous fantasies about the unattainable Tod. It’s starting to disturb the children. 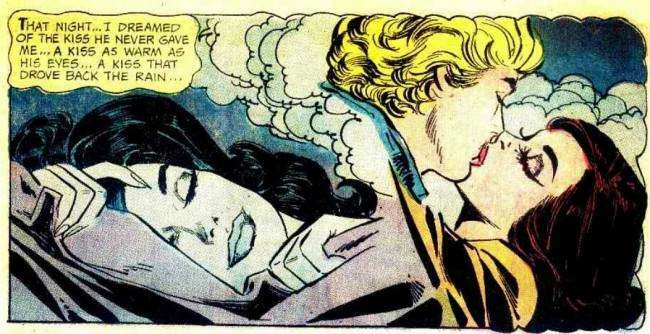 She’s dreaming of “the kiss he never gave me… a kiss as warm as his eyes… a kiss that drove back the rain”. 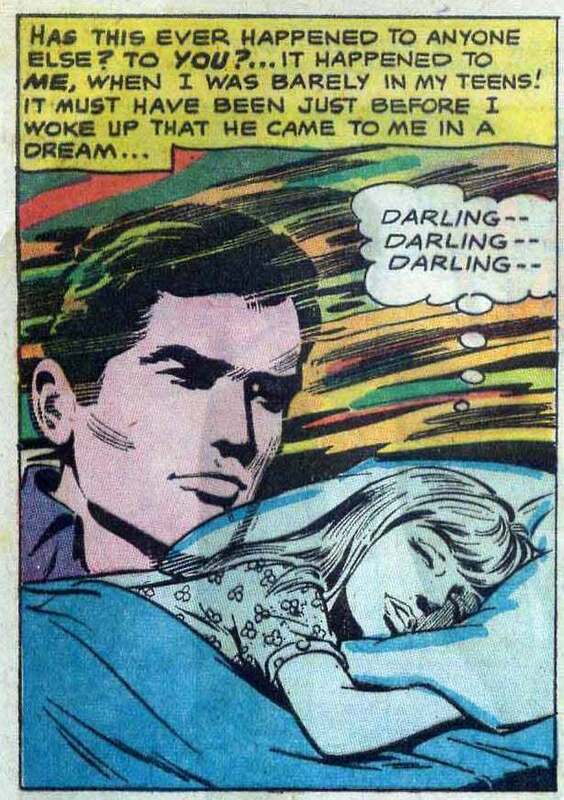 Meanwhile, he’s just dreaming of screwing her brains out. If there’s anything worse than a floating disembodied head, it’s a judgmental floating disembodied head. 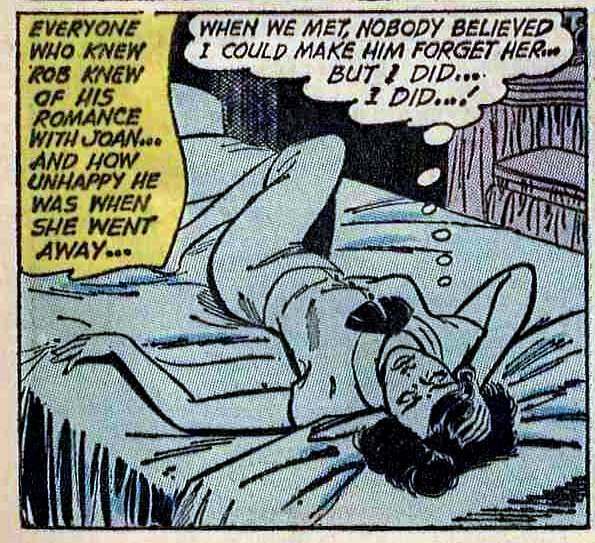 You’ll also learn from reading romance comics that it’s ALWAYS her fault. Like I said: ALWAYS her fault. 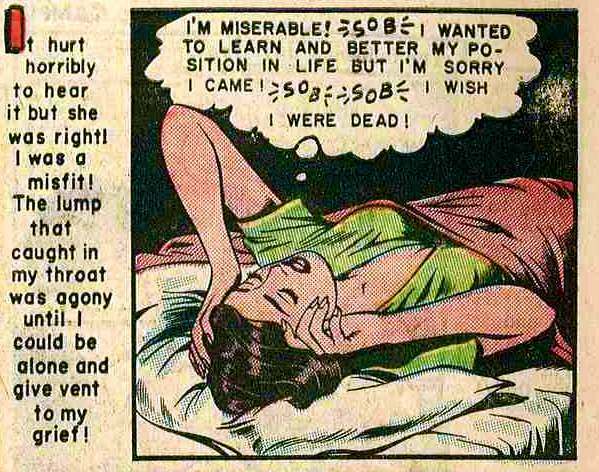 Self-loathing and paralyzing guilt were just a couple of the inner demons plaguing the mid-century woman. One begins to wonder if these women ever got any sleep. 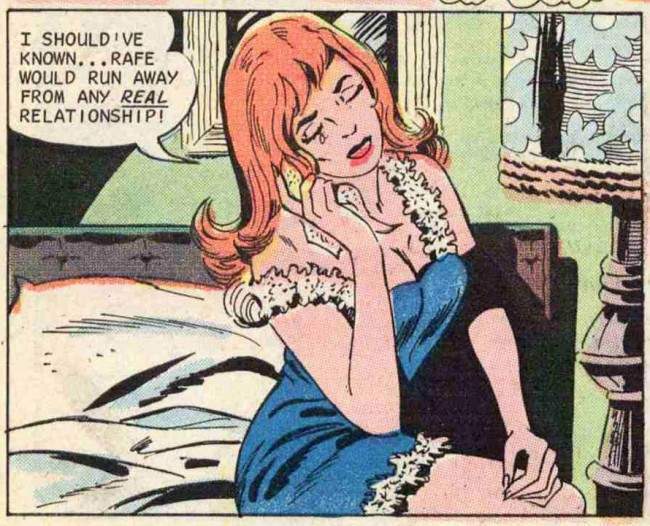 Bedtime in romance comics basically consists of self-abasement and soul-crushing anguish and regret – this doesn’t leave much room for some shut-eye. Perhaps, half their problem is sleep deprivation! 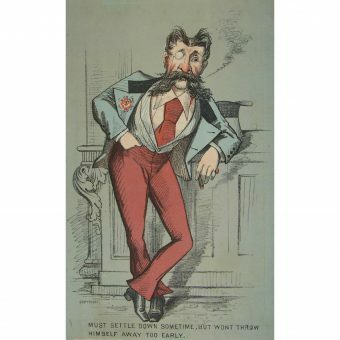 No wonder Valium was popped like vitamins back in the day. Anything to get you through the gut-wrenching misery of being single. 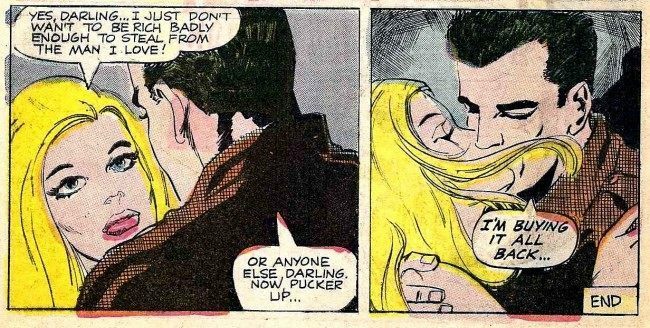 Truthfully, the women in these comics are knockouts. So, why are they spending all their evenings in a spineless heap, writhing in psychic self-immolation? This does not compute. 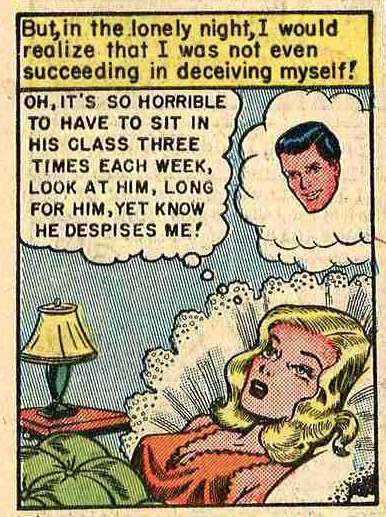 Welcome to the joys of the dating world according to the pages of romance comics. 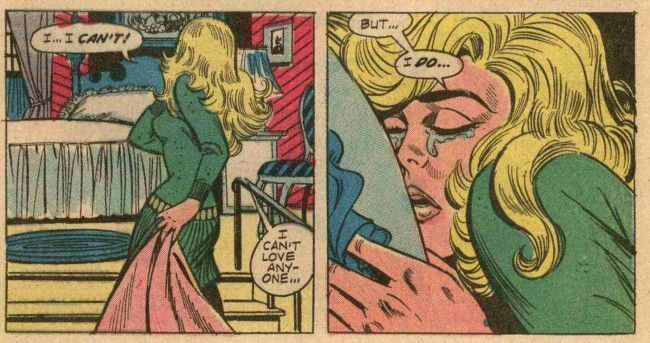 Misery: thy name is romance comic woman. That’s it, honey. Just obsess about every nuance of the relationship. Let it consume you, until you have scared him away and you’re left a quivering shell of a woman. It’s the right thing to do. All You Need Is Love… and a prescription for Benzodiazepines.